What Does 2018 Hold for Global Supply Chains? QIMA's 2018 Q1 Barometer offers a collection of unique insights on the state of sourcing, quality and compliance in 2017, as well as the trends that will shape the sourcing landscape of 2018. 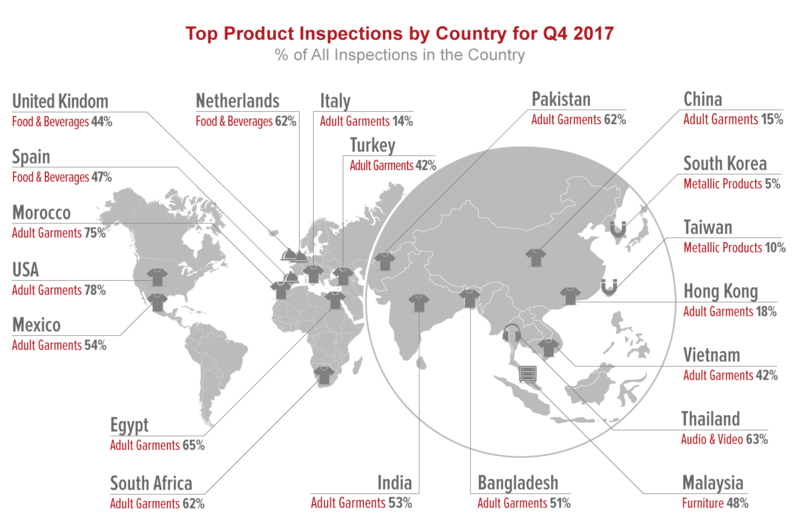 The analysis is based on the findings of QIMA Annual Global Sourcing Survey of 250+ companies working across the globe in all major consumer products segments, as well as data gathered in the course of 250,000 inspections, lab tests and audits performed in 85 countries in 2017. When looking at sourcing volumes by country, China is, once again, poised to exceed its 2017 growth forecast of 6.8%i, with QIMA year-end data on inspection demand showing robust +9% YoY growth. The sourcing giant stays firmly in the lead as the prime destination among QIMA clients, with two-thirds naming China among as their top sourcing region, and at least half expecting to buy even more from it in 2018. Nevertheless, China’s competitors in the Asia Pacific keep gaining ground, as seen by the expansion in Thailand and South Korea, where demand for inspections and audits rose by +19% and +26% YoY in 2017. Vietnam also remains an important geography among QIMA clients, especially for the Footwear segment: three-quarters of businesses expect to source larger volumes of footwear from Vietnam in 2018. Meanwhile, growth outside of Asia indicates that businesses continue to diversify their sourcing patterns, with Africa and Latin America being some of the more sought-after regions. At least half of QIMA clients already buying from Latin America expect it to account for a larger share of their sourcing in 2018, while in the South African region, inspection demand has increased by +11% YoY, according to QIMA 2017 year-end figures. The diversification of sourcing geographies reflects businesses’ high level of concern about some of the macro trends influencing global trade today. Namely, businesses surveyed identify changes in tariffs, quotas, protectionism and embargos as the most likely impactful factor for their supply chain in the near future. Manufacturing automation or big data analytics are somehow viewed as more distant trends for supply chains, with roughly 40% respondents rating their short-term impact ‘unlikely’. 3D-printing is even further down the road, with less than half of QIMA clients anticipating it to impact their business in the coming 2-3 years. On the micro level, the sourcing outlook of 2018 is dominated by concerns about manufacturing costs and product quality. The cost of production and raw materials was the most quoted sourcing challenge of 2017, and QIMA clients don’t expect that to change in the coming year. Meanwhile, the importance of managing product quality is anticipated to be an even stronger concern in 2018, especially in the Food industry. Ethical compliance of suppliers was rather low in the ranking of supply chain concerns, with less than 20% of QIMA clients listing it among their top 3 sourcing challenges. In fact, client perceptions seem rather optimistic: almost 98% of businesses believe that ethical compliance in their supply chain has improved or maintained the status quo during 2017. However, data collected by QIMA on the ground indicates that this optimism may be misplaced. Specifically, QIMA data from factory audits shows that ethical compliance in 2017 has overall deteriorated compared to 2016, with average ethical scores dipping by 4%. During 2017, the share of “Red” facilities with critical non-compliances has climbed to 32% (vs. 27% in 2016), while the percentage of compliant “Green” factories has remained flat around 33%. No individual industry has shown tangible improvement in ethical scores in 2017, while compliance deterioration was the most obvious in the Food sector, with average audit scores dropping by 11% compared to 2016. The irregularity and low frequency of supplier audits may play a part in the difference between perceived improvement and actual field data: as many as 20% of companies have no defined audit cycle, and some only assess new suppliers on a one-off basis. In addition, businesses overall struggle with supply chain visibility. Only 11% of the companies surveyed said they have full visibility over their suppliers, which means that a worryingly high 89% of companies have blind spots in their supply chains. Globally, an average company knows only around 55% of its suppliers, but for small operations, that figure is even lower at 38%. 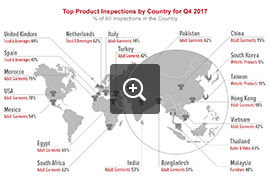 In the field, according to QIMA data gathered during onsite inspections, manufacturing quality has improved during 2017, with 23% of products being found outside of acceptable quality limits (vs. 27% in 2016). This is consistent with the trends perceived by QIMA clients, 70% of which said that the quality of their sourced products has improved during 2017. In terms of individual industries, Textiles, Apparel and Footwear remains the poorest performer, with 33% of inspected products found to be outside acceptable quality limits – albeit this figure represent a marginal improvement on 2016’s figure (36% outside AQL). Additionally, the Toys segment has shown the strongest improvement for in-factory quality (a 5-point drop in inspection failure rates compared to 2016), while the quality trend of E&E remained flat, with around 20% of inspections finding more defects than allowed. Compared to the perceived upward trend in mass production quality, QIMA clients’ outlook on testing performance in lab was more reserved, with only 54% of the respondents noting that product safety and regulatory compliance has improved during the past 12 months. Lab testing data collected by QIMA echoes these sentiments, particularly for products intended for the US market, where overall failure rates for safety tests have doubled in 2017 compared to 2016. Among the tested lots intended for the US, 8.1% of products were found to contain unacceptable levels of heavy metals, including lead and cadmium, while 9.0% failed the tests due to the content of banned phthalates. In the toy industry, chemical compliance remains a particularly pressing challenge: lab tests on toy lots headed for the US market showed excessive lead and phthalate content in 10% and 9.4% of cases, respectively. However, manufacturers targeting the EU performed notably better on the safety front in 2017: 3.2% and 3.5% of products failed to meet REACH requirements for heavy metal and phthalate content, which represents a 35% improvement on the failure rates of 2016.